Does that one have a beak? There are fascinating VR experiences that use first-person immersion to articulate incredibly poignant things—like say, the physical spaces that haunt our mental health. 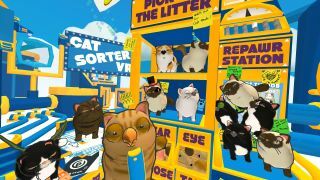 Then there’s stuff like Cat Sorter, in which you stand on the side of a conveyor belt stocked with a never-ending supply of mutant kittens. You pick each of them up, and pull off the unsavory bits (dragon wings, stilted legs, etc.) and deliver them through a vacuum. If you really want, you can instead try to throw the cats through a basketball hoop or a field goal post for extra points. There isn’t really much more I need to say. Cat Sorter is delightful. Yes, it’s another slight permutation on the Job Simulator/Rec Room/Surgeon Simulator archetype—you’ll be immediately familiar with the bright colors and the complete inability to move your feet, but it’s also airtight. There’s been so many times where I’ve strapped on a VR helmet and been forced to parse a million microscopic adjustments and reorientations before I felt at home. But Cat Sorter is seamless: you’ll be inspecting felines in no time. We’ve inherited a future where we can accidentally pull off a cat’s leg, turn around, and pick up one of the spare legs from the yellow supply boxes to fix your mistake. What a world. Designer Spencer Stuard tells me he specifically designed Cat Sorter for families, and the game comes with an adjustable height setting so kids of all ages can be efficient employees. At $US12.99 on Steam it’s a really solid deal for anyone lugging around an Oculus or Vive. He also addressed the one and only Cat Sorter controversy—sometimes the cats that come down the pipeline are equipped with silly headgear. I ran into a kitten dressed in a pirate’s hat, and I was instructed by the game to peel it off before sending it on its way. I didn’t want to. I am a passionate advocate for cats with hats, and frankly, I was upset that the game regarded such a thing as a problem. But don’t worry, help is on the way. "Our official statement is, we hear you loud and clear. There could be something in the works," laughs Stuard. "We take criticism to heart, and we are paying attention. We know you want the hats. We’re figuring out the right mechanic for the hat. Is it extra points? Is it neutral? Do you beat the game? Do we sell hats? Do we sell hundred-dollar sombreros? The door is wide open. We did it all wrong. We should’ve just made a game where you sell hats."